Tokyo, March 20: The Tokyo 2020 Olympic Games organisers, here on Wednesday, unveiled the design of its relay torch, inspired by Japan's cherry blossoms. The organising committee presented the design of the torch at an event, exactly a year before it begins its relay through Japan, coinciding with the blooming of the country's famous cherry blossoms, reports Efe news. The 710-mm-long torch weighs 1.2 kilograms (2.65 pounds) and is partly made from recycled aluminium, originally used in temporary houses built for those affected by the 2011 earthquake and tsunami. 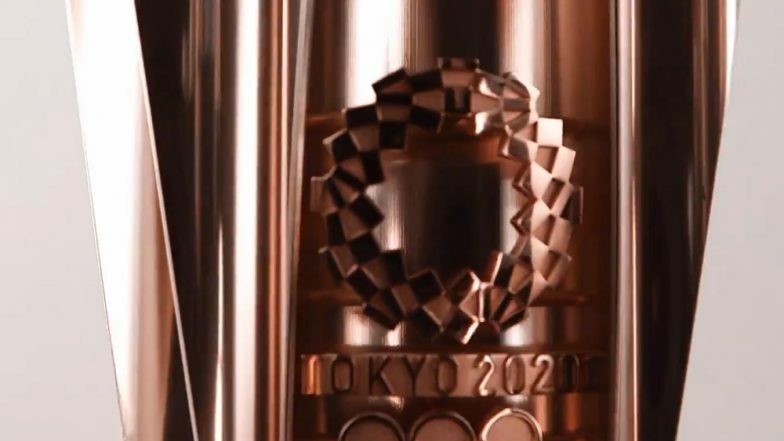 The upper end of the torch, which will hold the flame, comprises a central column with five petal-shaped attachments inspired by the cherry blossom and reminiscent of the five Olympic rings. Tokyo Olympics 2020: India Women's Football Team to Play Against Hong Kong & Indonesia Ahead of Round 2 Qualifiers. It also fits with the motto -- 'Hope Lights Our Way' -- of the relay. The torch's design and relay through Japan have been conceived with the idea of highlighting the message of hope for the regions that were worst affected by the 2011 catastrophe. The Games will take place from July 24 to August 9, 2020, while the Paralympics will be held from August 25 to September 6.